I collect sunrises. Some very special places have hosted my habit – the Alhambra, a rooftop in Delphi, the Roman Coliseum at Arles, the rocky shore of Maine, the high Sierras, and, in this photo, the southern tip of Baja California. Not limiting myself to the notables, I look for the east wherever I am. The quiet of the dawn, the solitude, and the sense of anticipation as sunrise nears heighten a sense of aliveness and amazement. Magic seems to happen. Mist rises, birds sing, fish leap, cares drop, and heart opens to a wondrous world. The day begins afresh. Pir Vilayat’s hearty expositions and meditations on beauty, splendor, and nostalgia awakened in a sunrise gave depth and clarity to what had been a private prayer. 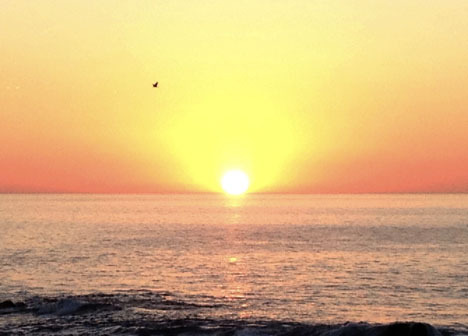 In contemplating the subject matter for this first blog post, synchronously on this year’s Easter morning, “sunrise” seemed a natural choice. Perhaps his words, which follow, will spark a greater joy and understanding in your sunrise experiences, and bring more light into the reach of your days.